2 Great photographers lost today in Libya – doing what they loved to do. 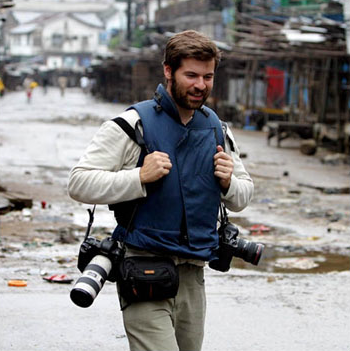 Today the lives of two friends and photojournalist colleagues, Chris Hondros and Tim Hetherington, were lost. Photographers Guy Martin and Michael Christopher Brown were injured as the 4 were covering the fighting in Misurita, Libya. It’s important to note that Chris and Tim were two of the best in the business – icons of our generation (my generation.) They were both incredibly accomplished and recognized journalists – their work received almost every honor and award that exists today for both stills and motion: from Pulitzer nominations, to World Press Awards, Picture of the Years Internationals, Robert Capa Gold Medal, Pew Felloships, Rory Peck Award, Alfred I. DuPont award and even an Academy Award nomination. Many of us grew up hearing of Robert Capa and other famous war photographers. Many of us idolized them. The first time I had an AK-47 pointed at me, I immediately knew that I wasn’t cut out for the incredibly dangerous work msyelf. Therefore I’ve always admired those who go out every day to cover conflict across the world – their work is incredibly necessary. Without their photographs, far fewer of us would be aware of what goes on in war torn regions. Few if any would see the atrocities being committed. A few weeks ago, Linsey Addario, Tyler Hicks (two close friends) and two other NYTimes colleagues disappeared for what seemed an eternity in Libya – but were eventually released. That was a hard enough period to deal with this year – it happened immediately after the Tsunamis hit Japan. Chris Hondros was a good friend. I grew up along side him in the Photojournalism ranks. It’s particularly difficult when something like this happens to a friend you know well. Someone who’s career you witnessed bloom – one step at a time, year by year. Chris was a modern day Capa – his work was unparalleled. Incredibly difficult for me to say much more right now n other than he made a tremendous contribution to the world of photojournalism throughout his career. Here is some of Chris’s work on the NYTimes Lens blog. I only got to know Tim Hetherington very briefly. But he definitely made an impression on me in the short time we spent together. His film Restrepo was an incredible piece of work – as were his photographs. I admire his ability to document the conflicts he covered both with a still camera and a video camera – to the highest level. You can honor him by watching the film on Netflix, DVD or Bluray to learn more about him and what he documented. His film (co-directed by Sebastian Junger) was nomiated for an Oscar this year. Both of these men won a number of the most prestigious awards in the industry – notably from the World Press Photo Foundation arguably the most prestigious awards for conflict photographers. Here is some of Tim’s works on the NYTimes Lens blog. I will miss them very much and I wish Guy and Michael a good recovery and safe journey home. I can say that both men died doing what they loved most. As much as I want to tell all of my friends and colleagues to leave that place in the world – I respect and admire what they do. I understand their need to be there to document history. At a loss for words. I only know of Tim’s work. The emotion that he captured in Restrepo moved me to tears. Both of these men, a great loss. I didn’t know either of them personally, but Restrepo made me cry. Outstanding work by Tim. Only very briefly i saw Chris’ work, but the Images he captured were outstanding. They will be missed by all of us. Rest in peace, my condolences to his family and friends. Without the help of the international media the Libyan people would have been unable to tell their side of the story. As a Libyan I salute Chris Hondros and Tim Hetherington’s courage & consider them as martyrs of the truth, freedom & the human dignity that the Libyan people seek. We will always be grateful. Their names will not be forgotten & their lives should be celebrated. Deepest condolences to their families & loved ones & may they rest in peace. great photographers with impressive portfolios. All the best wishes for the family and for you as being their friend. May their powerful work live on and show others the importance of what they were doing. Thoughts towards family + friends along with all the incredibly brave media in Libya and other dangerous parts of the world bringing people truth and transparency. So sorry to hear this, my sincerest condolences. Thank you for sharing in this blog. So very sorry for the loss of your good friends and amazing photojournalists. My condolences to all of their friends and family. My condolences to all who loved them. Tim was on my list of Photographers I really wanted to meet. 🙁 condolences. is another day to celebrate life. Let us not be saddened by their deaths, Instead let us celebrate their lives, and what they did for us, and how they loved doing it. Thanks to you both we shall forever know the meaning of sacrifice. Thankfully they gave us so many gifts in their images and stories that their memory and messages will live on. Vincent, you were one of the first people that came to my mind when I heard of this tragedy. I can only imagine what it would be like to lose a friend this way. I wish you and their families my sincerest condolences. They will always be remembered for the incredible act of humanity they were taking on, their emotional images, and their contributions to world of photography. Thank you for writing such a beautiful memoir on your blog. My deep sympathies for the loss of your friends. Our generation has lost two very brave souls! Both Restrepo and The Devil Came On Horse Back where amazing. My emotions were as others… extremely moved by these films. 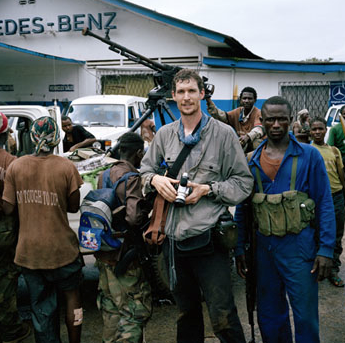 Tim Hetherington and Chris Hondros will be greatly missed…..
As a working photographer (albeit a wedding photographer working in a very ‘safe’ environment…) I love anything to do with photojournalism. The Reuters site updated daily is a web site I keep a keen eye on. The death of these two great guys makes you realise just how dangerous it is working in war zones. Obviously it is but I think when we look at the amazing pictures taken we forget the enormous risks involved in capturng these images. Guys like Tim & Chris brought us incredible images. Your blog is a great tribute to them. So shocking and so very tragic for their families. I’m so sorry for your loss Vincent. I looked at every image in awe. Vincent, my thoughts are with you and prayers for their families as well as with Guy and Michael. Monte Zucker was honored once along with several journalists. I remember his comment, “I have it easy because as a portrait and wedding photographer I photograph the world the way it should always be, but the photojournalist has to photograph the world the way it really is!” It’s a horrible loss to photography, but an even greater loss to the world. Chris & Tim are GIANTS. They will never be forgotten. Their work speaks volumes. Please honor them by visiting their sites and talking about their work. My condolences to their family and friends. Respect. Rest in Peace. This is most regrettable. A sad day for documentary/news cameramen. They are willing to risk there lives to “get the shot” as a lot of us have, but I don’t know if it’s worth the lives of two young men just so the rest of us can watch mankind at its worse and do nothing about it but spectate. My feelings go out to their families. I hope we bring a rapid conclusion to the war and put the ones who make money off of war (and who foster unnecessarily long, PROLONGED conflicts, i.e. Palestine and Israel) out of business. I salute the bravery of these young men. I condemn those who spread lies about the enemy so they can convince a father that it’s worth the life of his son to go kill another man’s son. It’s a sad thing for those of us left behind. It is a joyous thing that they died covering what they dealt with by takiing pictures of dead people in war torn places. They left at the top of their game and will be replaced by the next generation of war corespondents. They get my vote for the Ernie Pyle lifetime acheivement award. They were brave guys and now they are gone. Restrepo will be broadcast again this evening. There are so many reasons to see this incredibly honest and revealing documentary.